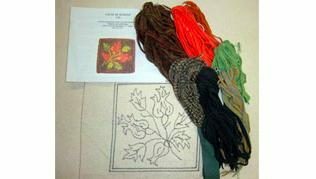 'Seasons- Fall Kit' for beginning rug hooking. $35 Kit contains; color photo, instructions for beginners, a pre-printed pattern, cut wool strips, binding for finishing. Hook sold separately. 'Seasons - Fall Kit' for beginning rug hooking. $35 Kit contains; color photo, instructions for beginners, a pre-printed pattern, cut wool strips, binding for finishing. Hook sold separately.